When Jesus began preparing to feed the 5,000, He asked Phillip where they might get the food to feed all those people. St. Andrew chimed in with “There is a lad here who has five barley loaves and two small fish, but what are they among so many?” How could St. Andrew have known that? He must have been, as they say these days, “working the crowd.” Rather than hanging around with Jesus as “the armor bearer” of so many modern pastors, St. Andrew was out with the people, engaging not only the men of the multitude, but also the children. He had such fellowship with the people that he knew what some small child had brought for lunch. The child was clearly a boy scout, by the way, since he alone among the whole multitude was prepared enough to bring something to eat! In Chapter 12 of St. John’s version of the Gospel, some Greek men wish to speak to Jesus. They approach Philip and say, “Sir, we would see Jesus.” Philip, the Scriptures tell us, went and told St. Andrew, and St. Andrew, in turn, went and brought the men to Jesus. One can almost see an awkward Philip approaching his friend and saying, “These guys want to see Jesus. What should we do?” and one might likewise imagine St. Andrew looking at his fellow apostle with confusion. St. Andrew would have walked up to the Greeks, shook their hands and said, “Hi, guys. I’m Andrew. Come with me and I’ll take you to Jesus.” He would have gotten all their names too and probably even remembered them later! 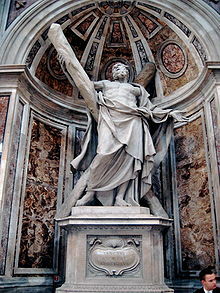 Saint Andrew was one of those people of whom it is said, “He never met a stranger.” Everywhere he went he fellowshipped with those around him. He made friends and he shared with them the greatest treasure he had, that was Jesus the Christ. In America today, not many of us go off into a foreign mission field. Fewer still go into an area that could really be called an “unreached area,” a remote location where the Gospel still has never been preached. All of us, however, go into a mission field of sorts whenever we leave our homes. Though we rarely think of it as such, our workplace is a mission field. Whether we spend our days in an office, taking classes, driving a bus, paving sidewalks or any other occupation, everyday we encounter someone who needs to see Jesus. They might not even know that they need to see Jesus, but they do need Him nonetheless. Before they can accept Him as their Lord and Savior, they first have to start a conversation with Him. Nine times out of ten, that conversation begins not with a man wearing a sandwich board sign ringing a bell on the street corner but rather that conversation begins with one of us. It begins with with one Christian taking interest in the life of someone who is lost and reaching out to offer our greatest treasure. Maybe, like St. Andrew, all we have to do is ask a co-worker “what do you have for lunch?” and then wait for the miracle to begin. May we all, like St. Andrew, have the grace to bring our loved ones, our friends, and even strangers to our Lord and Savior. They, too, would see Jesus. Almighty God, who gave such grace to your apostle Andrew that he readily obeyed the call of your Son Jesus Christ, and brought his brother with him: Give unto us, who are called by your Word, grace to follow him without delay, and to bring those near to us into his gracious presence; who lives and reigns with you and the Holy Spirit, one God, now and forever. Amen.